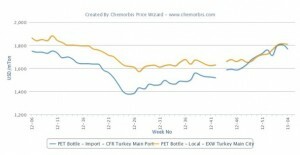 Import PET prices have caught up to the distribution market during the last few weeks for the first time in a year in Turkey, as per the pricing service of ChemOrbis. Distributors adopted a firm stance on their prices over the course of last week due to the lack of a healthy premium over imports while supply constraints in the local market also created an upwards pressure on the distribution market. 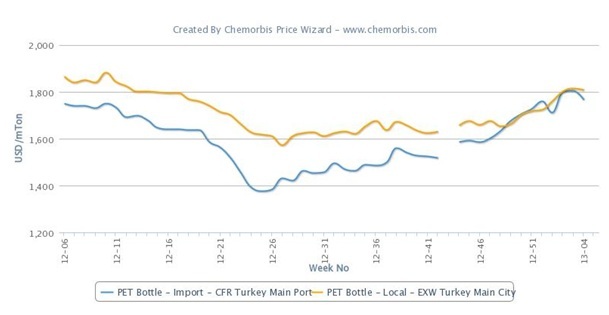 According to ChemOrbis Price Wizard, import prices of PET, after adding applicable customs duties, reached and even surpassed the local market level over the last several weeks. The local market has moved up continuously over the period, but import prices have kept pace. Only recently the import market softened slightly as the Chinese market is about to celebrate New Year holidays, which has dampened demand for Asian cargoes to some extent. A converter said that he finds the local market more competitive than the import market. “We have sufficient stocks for about one month as we had already purchased some PET last month,” the buyer noted. On the sellers’ side, a distributor reported offering close to the high end of the price range citing limited supplies in the market. “We are aware of the general tightness in the local market. Therefore, we maintain our firm stance on our prices. We are yet to see buyers’ response to this level,” he expressed. “We restored our firm stance again to offer at around $1800-1810/ton after selling some materials with slight discounts earlier in the week. Although Chinese New Year might cause some softening in the global market, the local market in Turkey still lacks a healthy premium over firm import market levels,” another distributor reported. A distributor maintained his local prices amidst his limited supplies. “We had to refuse one of our customers who intended to secure a large quantity since we were yet to clear our materials,” he stated. PET prices are likely to firm up as overall availability is very limited and many players refrained from replenishing their stocks during the upward momentum of import prices in the past weeks, according to him. “Although softer export offers from Asia ahead of the Chinese New Year holiday caused trading activities to slightly slow down in Turkey, many players are still searching the market for material,” he continued. In China, export PET prices on an FOB basis were stable to $30/ton softer during the past week following modest weekly drops in Asian feedstock costs, as per ChemOrbis. A stable price trend is likely to remain in place this week supported by high energy costs along with producers’ low stock levels.